Superbly situated self contained accommodation on the stunning South Perth foreshore, overlooking the Swan River and the Perth City skyline. 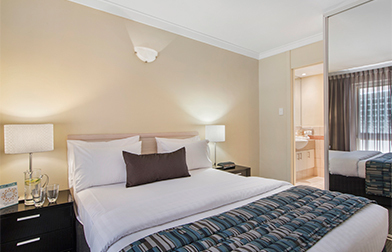 The four star Peninsula Riverside Serviced Apartments are in an ideal location on the picturesque South Perth river foreshore, only 5 minutes by car or ferry to the Perth CBD, and only 2 minutes walk from shops, supermarket, restaurants, cafes, post office and banks. The self contained one, two and three bedroom Riverview, Standard and Courtyard apartments include an equipped kitchen, dining/lounge area and separate bedroom with ensuite bathroom and are serviced three times a week. Facilities include, free parking, free foxtel, wireless broadband internet access, reverse cycle air-conditioning, and TV. Self contained one bedroom apartment with well appointed kitchen, dining/lounge area and separate bedroom with queen bed and ensuite bathroom. Most ground floor apartments have a courtyard garden while some upstairs apartments have juliet balconies. Please note that the third adult/child will be accommodated on a folderbed in the lounge area. There are no river views in standard apartments. Please notify us 48 hours prior to arrival time of cancellation to avoid a charge of one nights accommodation.